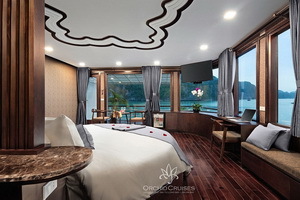 Alisa Cruise is proud of being 1 of some nicest upper premium 5 STAR cruises line in Halong Bay with 20 Private and Suites cabins. The cruise offers the best of both worlds: luxurious, traditional styling paired with sophisticated modern facilities and comfort, a cruise to truly experience this world wonder at its best. By genuine, we mean that our passengers deserve a genuinely friendly, genuinely reliable and genuinely professional service. Spacious and elegant accommodations invite guests to explore the romantic World Heritage Site of Halong Bay in unparalleled comfort and style. Alisa Cruise will provide the highest quality cruise product for mature and discerning travelers by offering the finest culinary experience at sea, authentic destination experiences, and a warm and luxurious ambiance on every voyage. 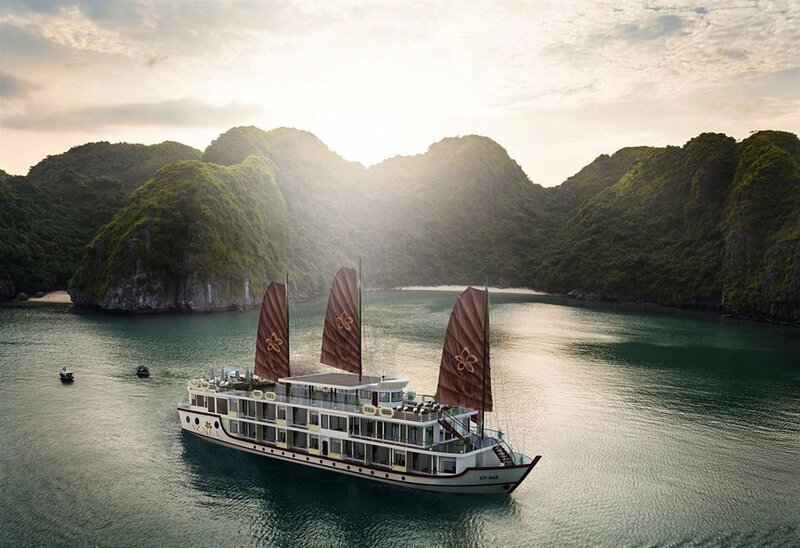 Combining a casually sophisticated on board experience with the most alluring destinations around Halong Bay, Lan Ha Bay, we provide our guests with a truly extraordinary travel experience. 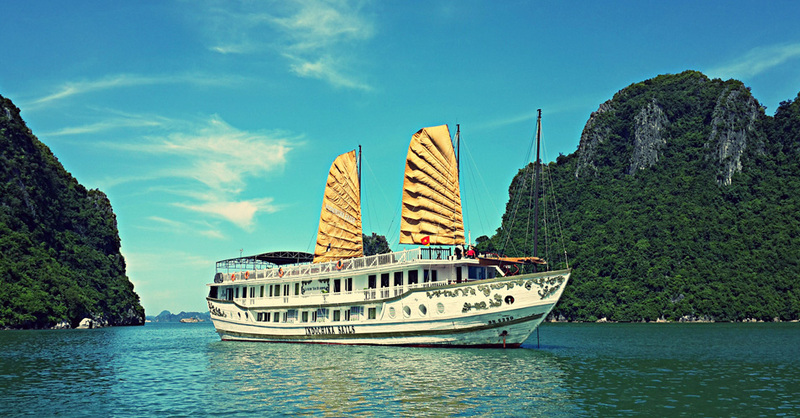 Alisa Cruise is the only luxury 5 star cruise offers continuous three-day cruise in a single trip through the Gulf of Tonkin, covering world-renowned Halong Bay & Lan Ha Bay. In addition to bringing the guests to the most remote parts of the area to provide them with an exclusive itinerary. Located on our front deck, the Family Suite Connecting is extremely popular with families and larger groups. It offers 2 double connecting rooms, a spacious ensuite and a large private terrace and has a total floor space of 50m². This suite is the perfect place to have a romantic candlelit dinner or a small private party. Alisa restaurant located on the top deck of Alisa Cruise. With a seating capacity of up to 50 passengers, Alisa Cruise restaurant offers air conditioned comfort with surround views of the incredible scenery. Adjoining our restaurant are large outdoor terraces for those passengers who prefer outdoor dining. Alisa’s talented chef and his assistants take pleasure in presenting you with a wide range of assorted dishes from around the globe. Specializing in Seafood, International and Vietnamese cuisines, our extraordinary dishes take on a blend of Traditional and Fusion flavors. Our succulent meals are only made with the freshest ingredients and produce available. Alisa’s kitchen are located on the same level as the restaurant and cleanliness is our priority. We can easily provide for any type of dietary requirements including vegetarian, children’s meals, non-seafood eaters or any allergies caused by food. Please inform Alisa Cruise of any dietary requirements at the time of booking your journey with us. When it comes to nightlife in Halong bay, there’s no better place to party in style than a sleek rooftop bar. Offering panoramic views of the ocean view and beyond, Alisa’s rooftop bars are rated as some of the best in the Halong bay. From natural charm of the Rooftop Bar to the ultra-modern Alisa Bar, rooftop bars on Alisa cruise cater to just about any mood and style. The rooftop bar enough to met and attracting the most fastidious customers, drinks and food served at rooftop bars here are veriaty and abundant. So, with excellent service, stylish ambience, and lively crowd, a night out at Halong bay’s most popular rooftop bars is definitely well worth after the first day to explore Halong bay. After a full day with many activities as: kayaking, swimming, visit floating village, you will go back to the cruise and relax on the sundeck and enjoy some drinks. After that, will transfer you to the Drum cave. Arriving in front of the cave, the candle light is decorated seem to be thousand of stars in the cave will lead you to the place where the tables are set- up, the food is well- decorated and ready to be served, the staffs welcome you. You are like to be in a different world with warm welcome, being private and romantic to enjoy. The dinner in the cave will be an unforgettable experience as much for the delicious and beautifully presented food, as for the romantic setting. This is a brilliant occasion, ideal for a honeymoon, wedding anniversary, birthday, or even a special surprise for your loved one. Enjoy, share, relax – it will make your trip even more memorable. Our crews will welcome and provide you unique experience elegantly; they will cheer the group or prepare a romantic private space for couple. On the top level of the Alisa cruise is the ship’s sundeck. Perhaps the most iconic place from which to enjoy the brilliant scenery of Halong Bay as it unfolds around you, the sundeck is equipped simply with wooden loungers and cushions, coffee tables and umbrellas. 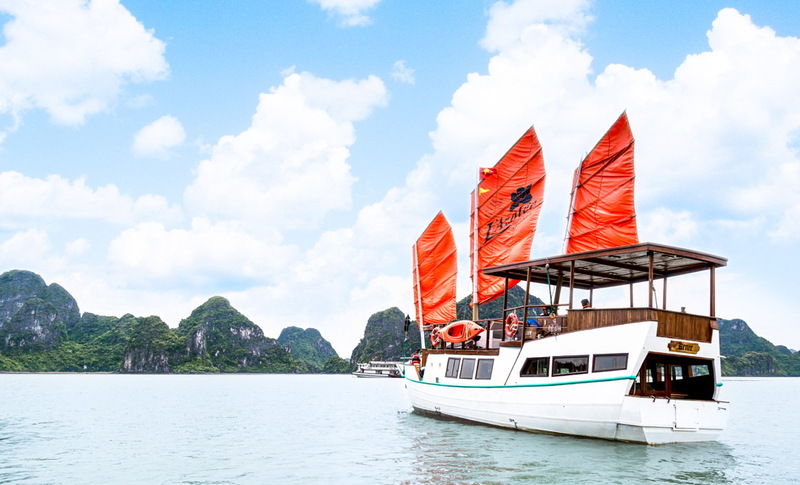 More than a few of our guests spend large portions of their cruise up on the sundeck, enjoying a good book or a drink, sunbathing, photographing the bay, or simply relaxing with friends new and old, all while cruising through Halong Bay’s vertical limestone labyrinths. Alisa Suite Bathroom was designed for perfect pleasure with 5 star – luxury amenities standard . The only thing you should to do is just only lay down on Jacuzzi and contemplate Halong Bay through the window We are surely it will bring to you a very special feeling and unique experience on our Cruise. With Alisa Cruise , we are passionate about looking after our guests and we always do our utmost best to ensure every stay is hassle free and memorable. 16:00 Visiting Halong Pearl Farm Village. Travelers will have chance to visit Floating Pearl Farm and see how local people produce the great pearls. This Pearl Farm Village was established in 1995 by a Japanese organization, after years run by Japanese experts, it was transferred for Vietnamese. Our guide will show you round the farm and the museum there and explained how the process is done. You will pass a floating raft where some kinds of oyster pearls are grown and transplanted such as South Sea pearl, Tahitian Black Pearl,…etc. After that you will see a processing room where workers transplanting oysters and understand some precious species of pearl. The last, you could see one of the workers here opening an alive oyster in front of your eyes to see pearl in side and then have look their achievement in the showroom! 14:30 Arrival Luon Cave where you go kayaking on the bay in Luon Cave Area- The most beautiful area in Halong Bay with wild nature beauty. 15:00- 16:00 Visiting Titop Island, where you can climbing up to the top of Titop Island, taking photos, Swimming, Sunbathing and relaxing…..
17:30 Come back to our Alisa Cruise and relax by enjoying Sun Set party with Juices,, and fruits on Pararoma Roof Bar. 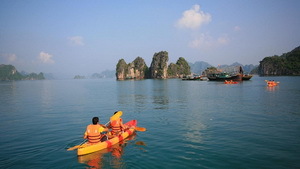 08:30 – 10:00 Transfer to Day Boat for Exploring Halong Bay where you can enjoy KAYAKING, explore daily life with local people or by yourself. 06:30 Early morning sun rise to enjoy Tai Chi lesson on sundeck. 08:30 -10:00 Transfer by tender to Sung Sot Cave ( Amazing Cave). Walk up about 100 steps to the cave entrance. It takes approximately 45 minutes for cave visiting. Visit Sung Sot Cave, one of the most biggest cave in Halong bay with beautiful stalactites and stalagmites. Return to the boat by tender. Proper shoes are highly recommended. • Entrance fees, taxes and service charge. • Luxury accommodation with A/C, shower, mini bar. • Kayaking or rowing boat. • Meals on-board ( 5 main meals + 2 breakfast). • Sunrise Tai Chi demonstration. • Cooking class on cruise. • Tips for tour guide and driver. 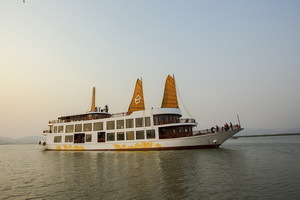 • Shuttle Bus Hanoi- Halong Bay- Hanoi: Limousine bus (+ 30$) and 16-seat-bus.